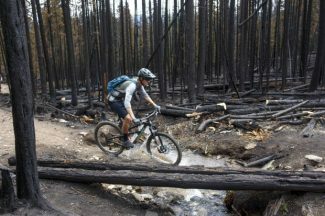 SUMMIT COUNTY — Dozens of trails in the Breckenridge area pass by long-abandoned ruins and other remnants of Summit County’s mining past. But, Galena Ditch is one of the few to travel directly over them. 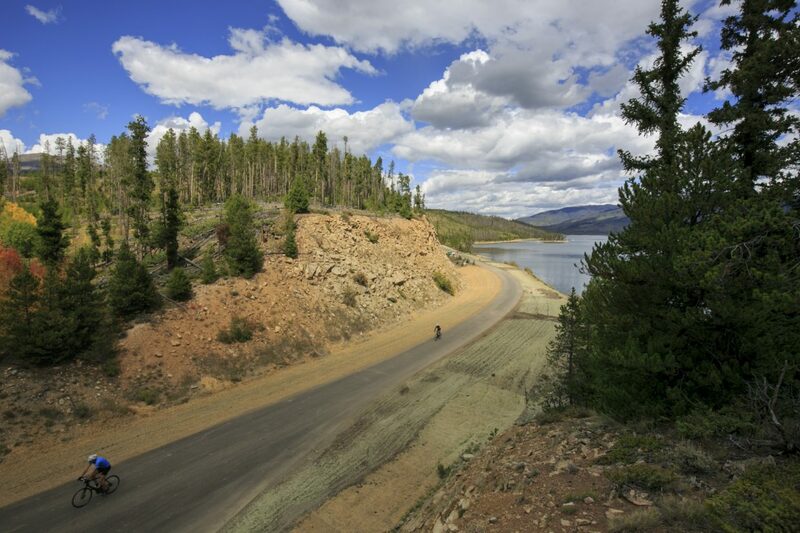 In 2012, volunteers completed work on the 3-mile slice of singletrack in east Breckenridge, using the rock-strewn lines of an old water-diversion ditch as a blueprint for whip-fast riding on a needlepoint ridge. The ditch, originally constructed approximately 100 years ago to convey water to area mines, reopened to accommodate hikers and mountain bikers traveling between the popular Horseshoe Dredge Trailhead and the three forks of the Swan River and the Colorado Trail. Galena Ditch is essentially a connector trail, but it’s a wild ride just the same. 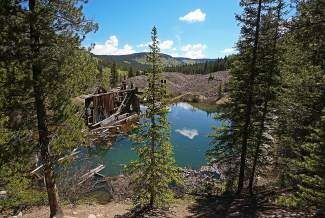 It also sees less traffic than French Gulch, another popular system littered with mine tailings and historic dredges, making it a near-perfect tour of Breck’s mining heritage — minus the crowds. The Galena Ditch trail and Summit Gulch Road access road cross through private property. Please respect property boundaries and stay on the trails. Although the trail stays relatively flat from start to finish, the majority is on a knife-like ridge surrounded on both sides by steep pitches. Balance is key. The main Galena Ditch trailhead begins at Summit Gulch Road. The early section is flat and heavily forested. After about ¼-mile, the trail becomes narrow when it meets with the titular gulch. 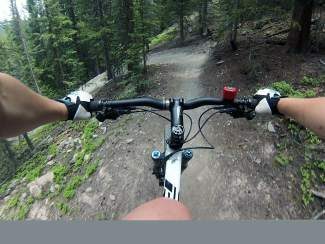 Expect mellow climbs and dropped littered with sharp, ragged rocks as the trail follows the ditch for nearly 2 miles. Keep an eye open for several mine tailings in the surrounding woods. After the first 2 miles, the trail slowly breaks away from the ditch and the narrow ridge. Continue straight through wide-open pine stands and meadows for another 1 mile, passing an abandoned piece of double-track that leads back to Tiger Road and the Tiger Townsite trailhead. The Galena Ditch trail ends near a junction with Rock Island Road. From here, turn around and return the way you came. Unlike many trails, both directions are equally rewarding for climbers and downhillers alike. 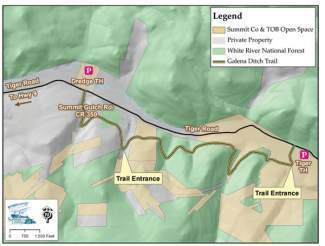 Parking is available at the Tiger Dredge Trailhead near Summit Gulch Road and the Tiger Townsite trailhead. To access Tiger Dredge Trailhead from Breckenridge, drive north on Highway 9 and turn right on Tiger Road (by the Breckenridge Golf Course). Continue for about 2.5 miles. Shortly after the pavement turns to dirt, turn into the Horsehoe Gulch/Tiger Dredge parking lot on the shore of a pond containing the remains of a historic dredge boat (across the road from a log fence). Cross the road to the south and climb for about 1 mile on Summit Gulch Road. The Galena Ditch trailhead is on the lefthand side at a timber fence.